Have you heard the story about Vowel Suffix Bullies or the one about Supersized Spellings? Students of all ages love a good story, especially when it’s set to music and involves movement. CR Success students explain phonetic patterns with ease after one engaging lesson. The CR Success Concept Book is the perfect tool to help students learn, remember, and connect explicit phonics knowledge through the use of visual posters, stories, songs, gestures, and word examples. The twenty-five CR Success concepts teach the entire English phonetic code. Use with your current reading program! Do your students start near the same level in word study every year? Are students doing the daily sorts but never seem to be applying the pattern? Are your teachers able to explain the why behind the patterns? We have the solution! 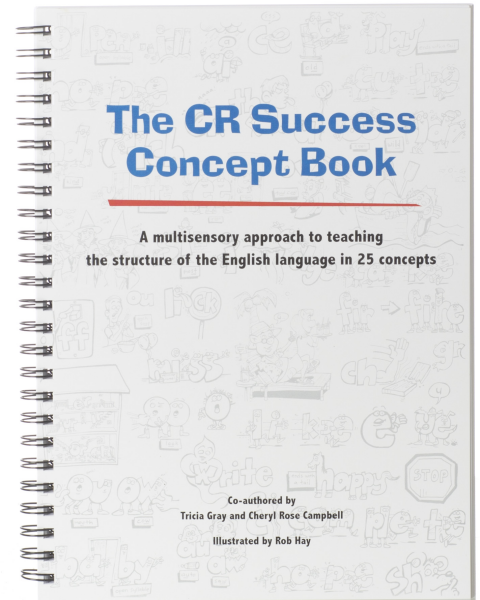 The CR Success Concept Book is perfect for balanced literacy classrooms and word study instruction. A 2-hour training video link is available for purchase. Schools that purchase 10 or more Concept Books will be given free access to the training video. Contact tricia@crsuccesslearning.com to learn more! Priced at $195, this will become a teacher’s most valued tool!